These savoury fennel biscuits are a traditional favourite in every Italian family. 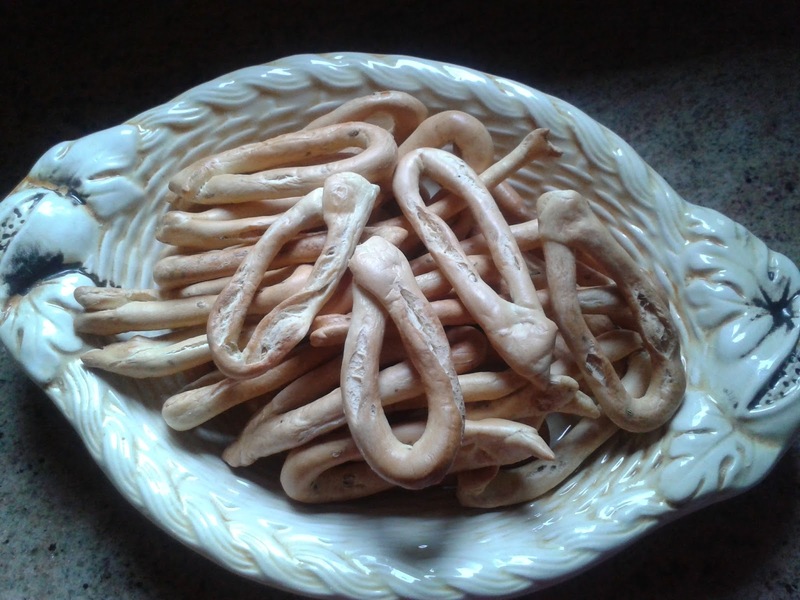 There is a variation of these biscuits that uses aniseed liqueur (anice) and the aniseed seeds and call them 'Ossa di Morti' (Uosse demort') which translates as dead man's bones. Not very appetizing when you label them that way! 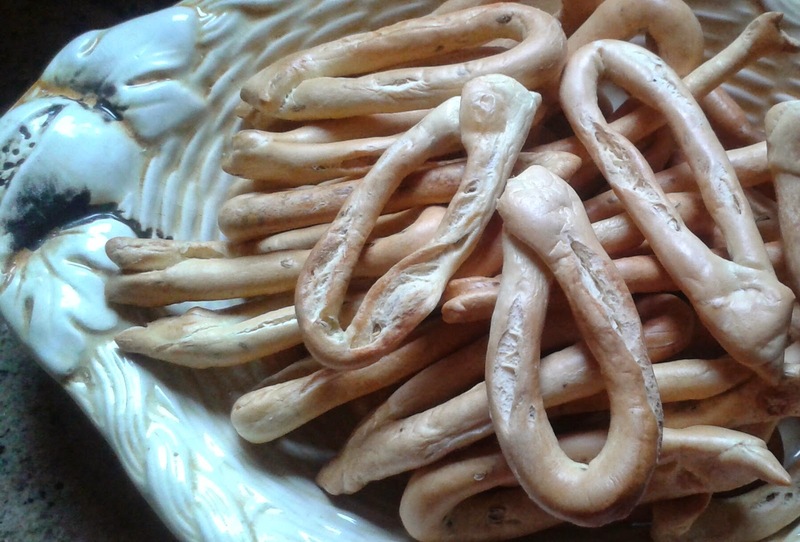 We call these biscuits Taralli con Finocchio. Traditionally these biscuits were made with lard but more recently that ingredient has been substituted with olive oil, which is far more flavoursome and healthier. 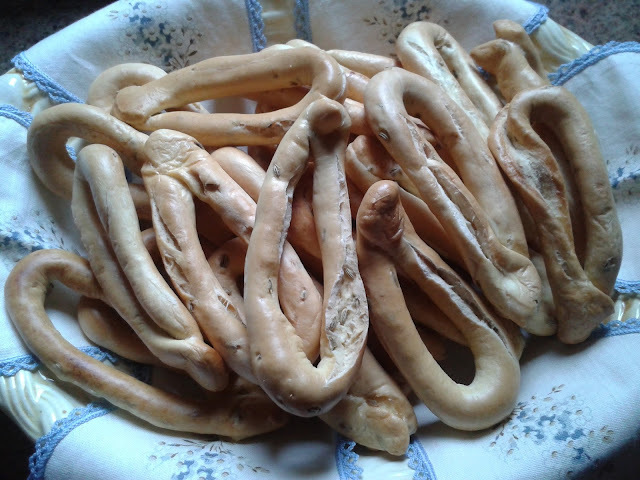 My mother has always used her own way of measuring - (all'occhio) not exact quantities, hence these biscuits have always turned out differently when she makes them. Regardless... her grandchildren prefer Nonna's biscuits. I was determined to make them and document this recipe that has been passed down from my Nonna. In a bowl, mix flour, salt and fennel seeds. Beat eggs and oil and combine all ingredients as though you were making home made pasta. If the dough is too dry, you can add some water. Knead the dough until smooth and elastic (10-15 minutes) and allow to rest. Divide dough into 6 portions and roll into logs. Continue rolling out long finger thick strands approximately 10cm long and loop joining two ends to form into tear drops. Bring a large pot of water to the boil. Drop three or four biscuits at a time and remove them once they rise to the surface. Place on a tea towel, to allow to cool. Arrange on a baking tray and bake in a moderate oven for about 20 minutes until golden brown. They are really nice to eat with antipasto and a glass of vino. In fact my paternal grandmother used to dunk them in a glass of vino.